Moonaadem are a solo project from Lebanon that plays an ambient form of black metal and this is a review of his self released and self titled 2017 album which will be released in June. A very dark yet heavy sound starts off the album along with some grim yet high pitched black metal screams while t he music also evokes a depressive edge at times as well as mixing the ambient elements into the heavier material and there is also a decent amount of atmospheric synths. All of the musical instruments on the recording have a very powerful sound and when the music speeds up a decent amount of blast beats can be heard which also gives the songs a more raw feeling and when guitar solos and leads are utilized they are done in a very melodic fashion. Throughout the recording you can hear a great mixture of slow, mid paced and fast parts and spoken words are also used briefly along with a brief use of acoustic guitars while a later track introduces clean singing onto t he recording which also adds in a touch of post black metal while the fast riffs also utilize a decent amount of tremolo picking and one track is all instrumental. Moonaadem plays a style of ambient black metal t hat is more guitar driven than most bands of this genre while also mixing in some more modern and post elements, the production sounds very powerful for being a self released recording while the lyrics cover life, death, grief and nature themes. 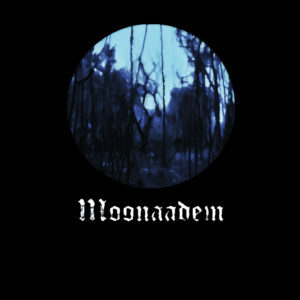 In my opinion Moonaadem are a very great sounding ambient black metal solo project and if you are a fan of this musical genre, you should check out this album. RECOMMENDED TRACKS INCLUDE "Multivers" "Desillusion" and "Marche Funebre Pour La Morte De La Terre". 8 out of 10.